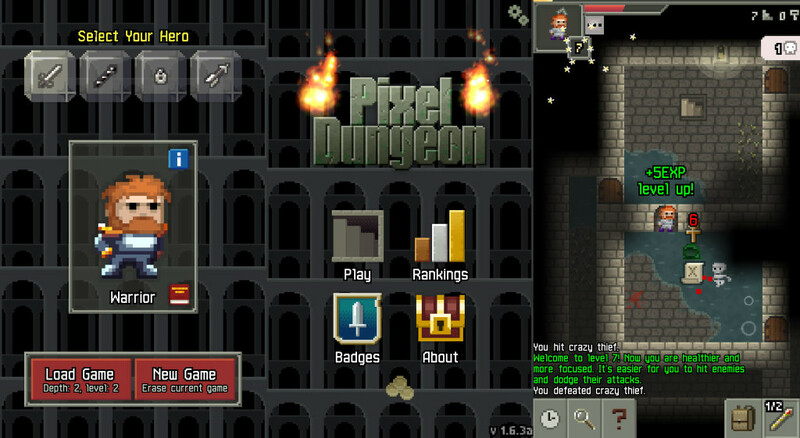 Pixel Dungeon is a free to play side-scrolling 2D roguelike game in which you control your hero in a series of 25 randomly generated dungeon segments, with the goal of reaching and beating the fifth boss. The game has permadeath: if your character dies, you’ll lose all progress you’ve made up to that point and will have to start from the beginning. It is also a turn-based game, meaning that nothing happens if you stand still, giving you ample time to plan your next few moves. The following tips will assist you in reaching the endboss and claiming victory. There are several items and helpful methods of testing out your unidentified potions and the path ahead of you. For the potions, stand in a tile of water, or near a door, and throw your potion in front of you. If it emits poisonous gas, then that potion type will be the poisonous gas potion in that playthrough. If you haven’t identified the healing potion by the time you reached the first shop, it is almost always the one with the highest numbered amount of items. The same goes for scrolls; the recommended method for testing scrolls is to have at least one item to be identified, and another to be upgraded in your inventory. Test scrolls at the end of a fully explored depth to avoid being teleported into a high-level area. For the path ahead, you can use the Wand of Telekinesis, which will activate any traps on the fields which you manipulate with it. This can be very useful especially in corridors. There are several different strategies on dealing with enemies. The most common method is killing them one by one. Lure packs of monsters into a corridor and kill them one at a time. Another good tactic is if you have a Wand of Amok, use it on a monster to confuse it and make it attack the others in its group. First, you shouldn’t worry too much about hunger, as you’ll be at least hungry for most of the game. You should only worry if your hero is starving; then immediately eat something to prevent him losing HP from hunger. If you need to recover HP, several options are available. Seeds of Sungrass should only be used in a safe location, because its effects will immediately end if you move. You can also use Healing Potions, or if you are a Warrior, then eating food will restore 5 HP per eat. You can also sleep by holding down the Wait button; but pay attention to Hunger in this case, as it will fall fairly quickly after not eating for a while. Mystery Meat is dangerous to eat, but you can use various fire-related items, such as the Wand of Firebolt, Potion of Liquid Flame, throwing it into a Fire Trap, to convert it to Chargrilled Meat, which is safe to eat.